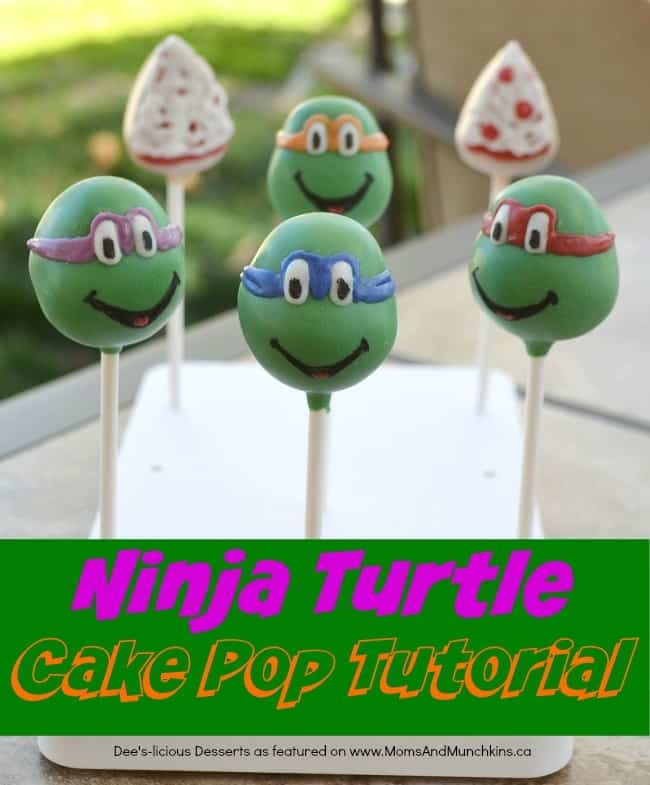 This Ninja Turtle Cake Pops tutorial is courtesy of our contributor Deanna…Hope everyone had a wonderful Valentine’s Day filled with roses and chocolate candies! We don’t celebrate it much, my husband says he doesn’t need a day to gift me flowers…(say that to my 4 empty vases!) No, kidding. We spent the day together, and went to dinner at the same place as our first date…Taco Bell! hah! 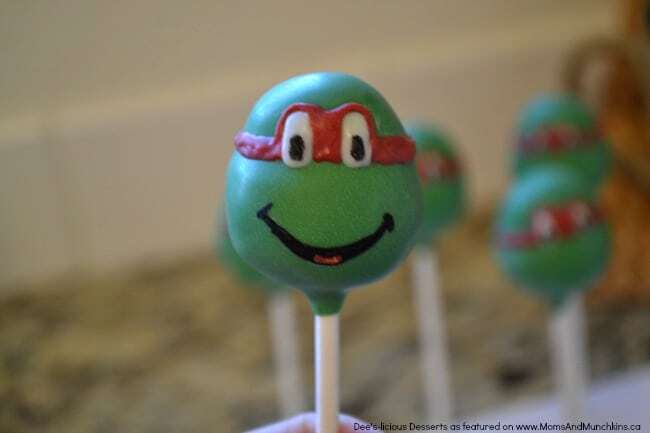 So I wasn’t really sure what to do this month for a tutorial, but I had a rather big order for TMNT cake pops, and figured I would turn it into a tutorial…two birds, one stone kinda thing. 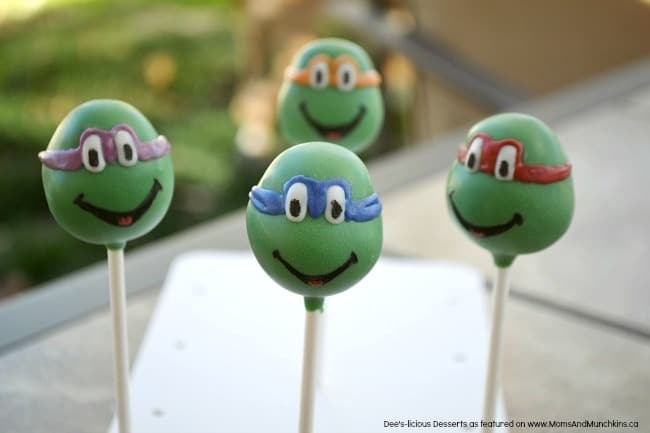 So here are your heroes in a half shell! 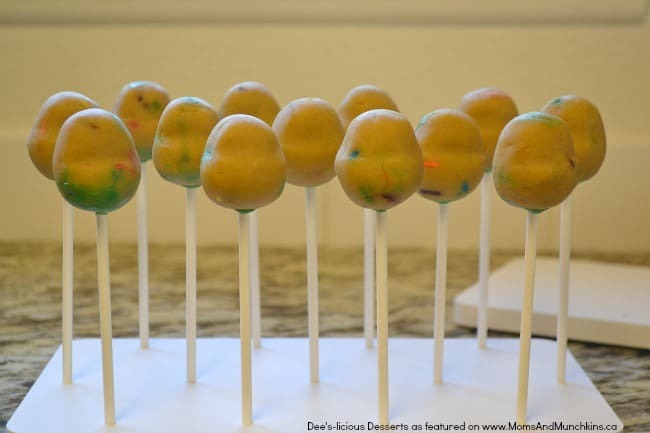 Shape your cake pop dough. 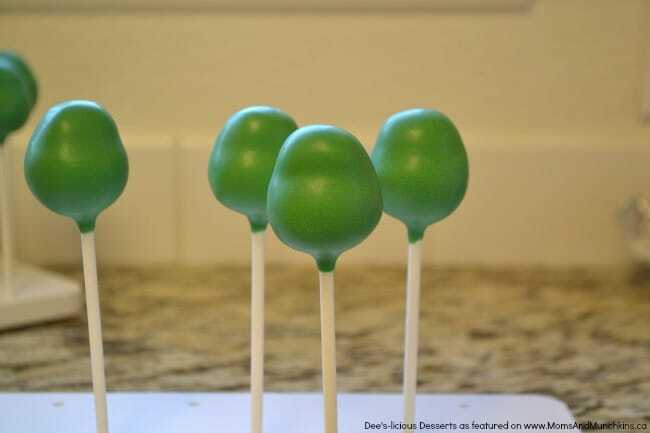 Dip your stick into the green chocolate, then into that cake pop. Fill in any cracks with chocolate. Let harden. 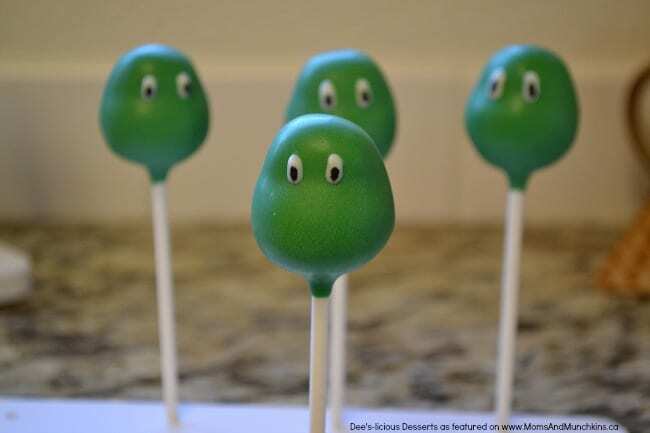 Dip entire cake pop into the green chocolate and tap off any extra. 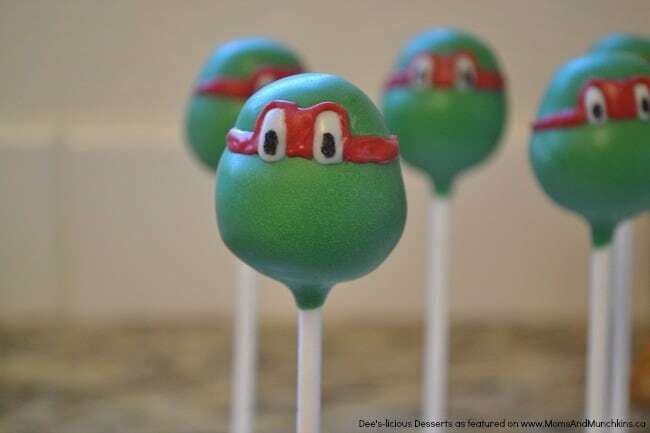 Place cake pop into your stand and let harden. Dab on some eyes, I noticed I liked them bigger and kind of in a bean shape. 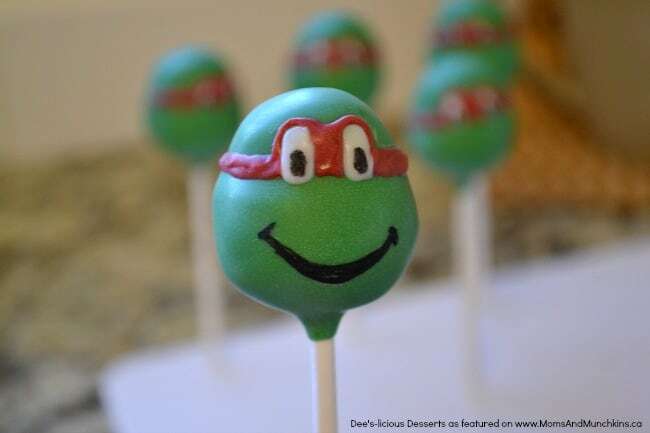 Taking your edible marker (which can be found in most craft or baking supply stores) give your turtles some pupils. Take blue, red, purple, or orange chocolate and (using your toothpick) draw on the mask. Drag the chocolate all the way around the cake pop. 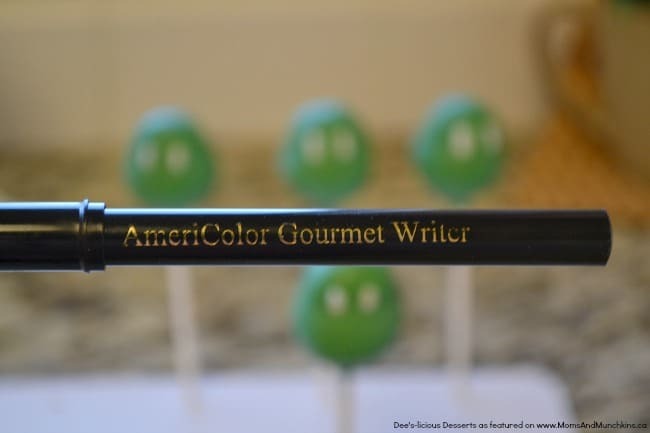 Going back in with your edible marker, draw on a smile. 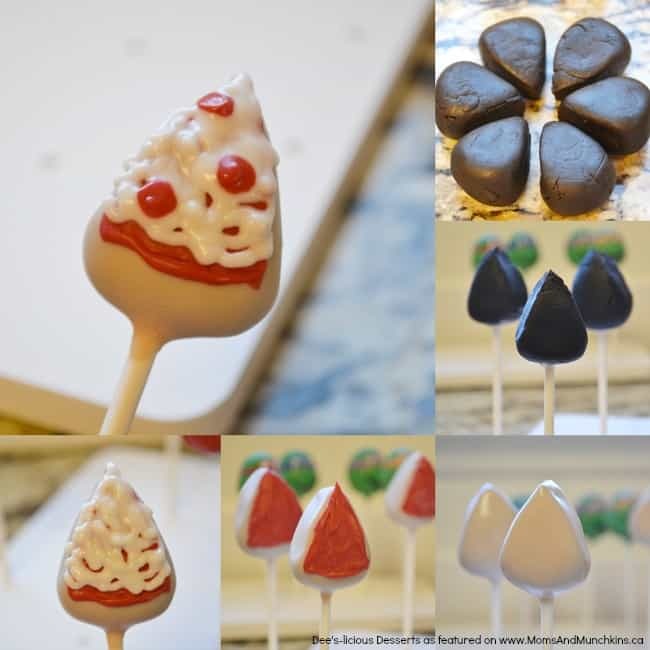 Stick the tip of your toothpick into the red chocolate and add a heart-shaped tongue. Now what’s TMNT without some deep dish action? Since I had to make these pizza slices anyways I snapped a few photos of what I did…it’s just like making a real pizza! 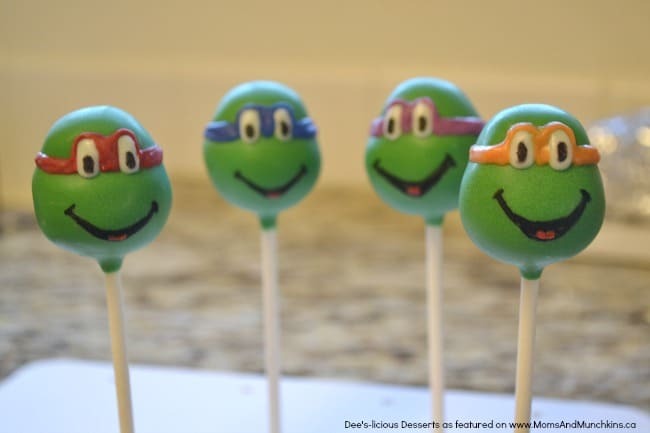 For more adorable & delicious creations, follow Deanna’s Facebook page Dee’s-licious Desserts. 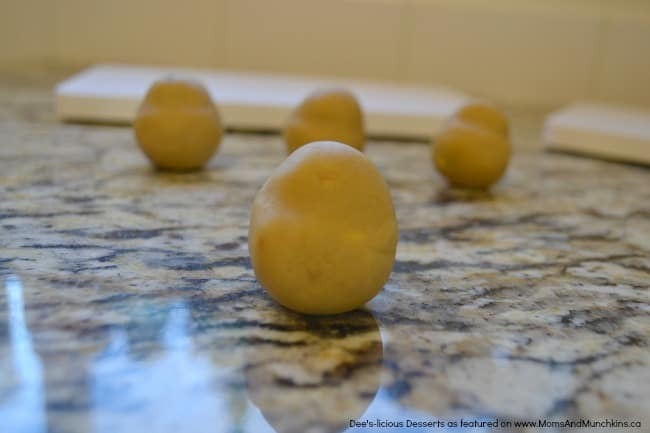 She also has a blog, Deanna’s Kitchen, with tasty recipe ideas you’re sure to drool over. 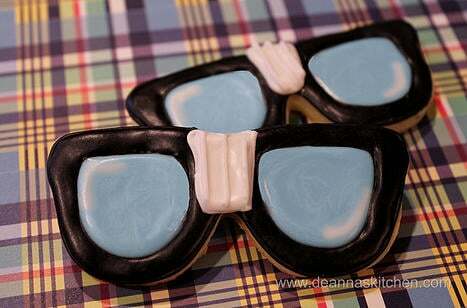 This cute Nerd Glasses Sugar Cookies tutorial would be perfect for a end of the year or back to school party! OMG! These are freaking adorable. Thanks for the tutorial – pinning! Thank you, Crystal! 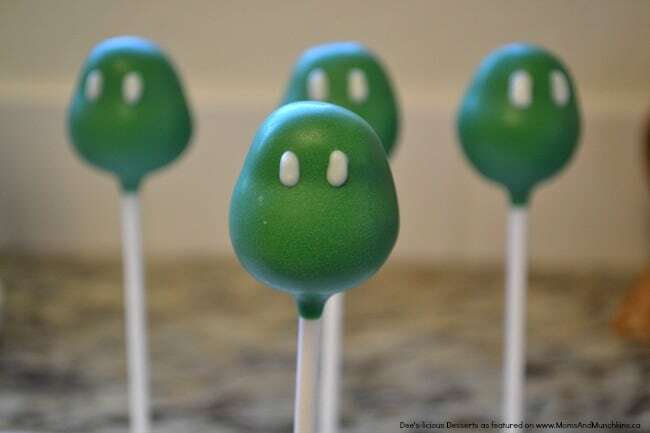 Deanna has such a great talent with cake pops. I was wondering how do you keep your chocolate from peaking while your decorating areas such as the eyes. LOVE your site! Thanks for posting 🙂 I was wondering what color of greed did you use? Light or dark green? Thanks so much! 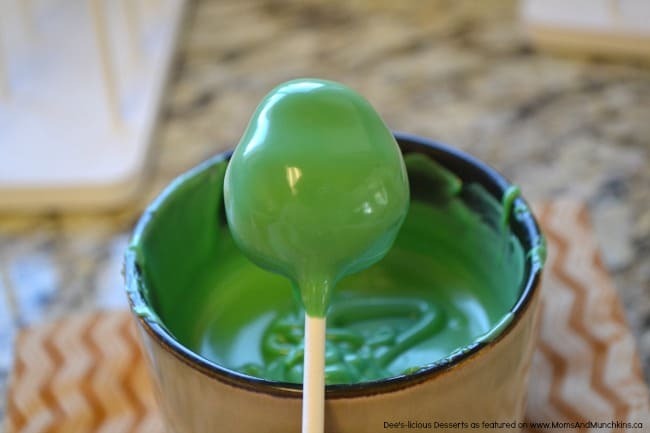 I used wilton brand “green” candy melts.